Step 1 Preheat the oven to 180C/350F degrees. Step 2 In a bowl, cream together the butter, cream cheese and erythritol (or sugar substitute of choice). Add the lemon juice and rind. Beat until smooth. Add the desiccated coconut, almond flour and salt and beat until combined. The mixture will be sticky. Line a baking tray with parchment paper. Using damp hands make a walnut sized ball from the dough and place on the baking tray. Press down gently with either your hands or the back of the spoon into a cookie shape. Step 3 Bake for 18-20 minutes until golden BUT flip the cookies over gently and carefully halfway through cooking. Reshape if need be as they will be very delicate. Step 4 Cool and store in the fridge to firm. Chewy lemon coconut cookies that will have you reaching for another. At only 2g net carb per cookie you can help yourself! 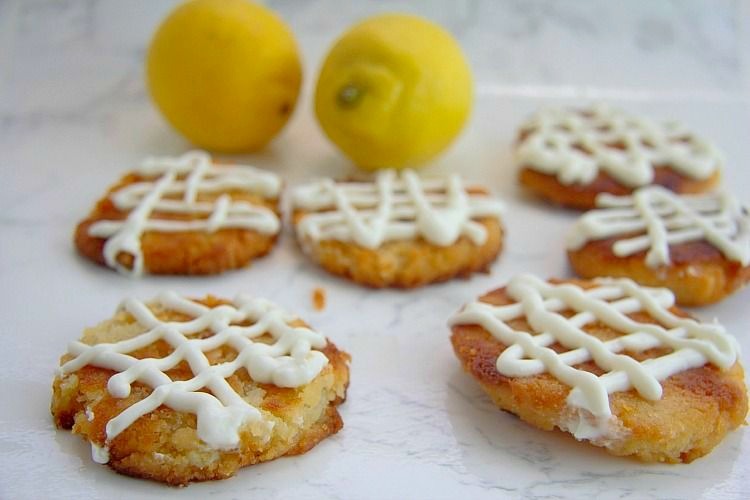 If you enjoy my cream cheese cookies, you will love these lemon coconut cookies too. They are made in a similar way with the softened cream cheese and butter but this time I used almond flour. I have not tried a version with coconut flour but if you adjust the quantity of the flour it could work.